What do all three have in common, you ask? Nothing really, except for the fact that I am writing my first post from Dubai. I managed to save a little time for some thoughts. Dubai is an extra ordinary city developing at a break neck speed. I have been here many times before, but the incredible night time urbanism couldn't be more rightly exposed to me on any other occasion than during the time I was on my aircraft bound to the Dubai International Airport. With the airplane skimming the ground at roughly 7000 feet in the air, I could see the breathing life of the city in sparkling dots of electricity and power, most of them radiating from the multitude of roads, skyscrapers and other massive civil engineering projects many hundreds of square kilometers in area. 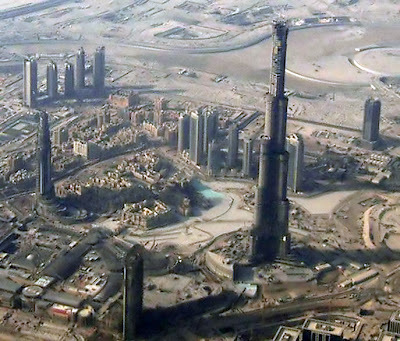 Burj Dubai, the world's tallest tower is hardly complete, but it has already made any other completed structure anywhere else in the world look like a joke. For you engineering savvy folks, check out the wind engineering being done on the world's biggest concrete beast. I will not talk more about Dubai but I simply want to add that the amount of development and the money going into these is just outrageously ridiculous. If you think that the reconstruction money for Iraq is a staggering amount, think again. Dubai is pouring more than 100 billion into its projects. Thats twice the foreign investment of China. People who have been here will say that in a few years, post modern Dubai (which was simply a desert some 30-40 years ago) with its sprawling city life, massive skyscrapers and some of the biggest shopping complexes in the universe will easily put the best cities any where in the world to shame. Where in the world does all this money come from? Much of the answer probably lies in all the foreign investment and tourism money being poured into this strategically well placed region. The saying here is that if you pull the expatriates out of area (which should be more than the local population), the city's economy might probably collapse. Dubai, as someone aptly put it, is really one vast construction site. And it just doesn't build. It builds world records. The costs are many. It is expanding so fast that increasing living costs, traffic jams, environmental damage and the rich-poor divide is the order of the day. Whether all this is leading somewhere worth it, or to complete collapse, I don't know. All I can say is that the story of Dubai will be a different one in your urban development case study class. Through a brief survey on the Internet, I somehow managed to jump onto a new updated co-efficient of rolling resistance study done on scores of leading racing tires. What I like about it are how they spell out the conditions of the tests, error analysis and other variables in question. Time to rethink tires and head to a bike store? Find out. Bike Tech Review have been a decent party at testing bike products and you will come out more enlightened technically after reading some of their testing work. I will add this link to the Honeycomb on the left. 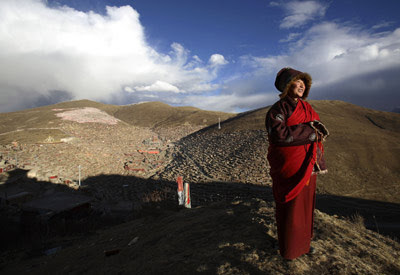 Tibetans, interestingly, are unlike other mountainous folks from around the world. As relevant an adaptation that increased red blood cell count is after living/training at high altitude, Tibetans, on the other hand, have an extra something others don't, according to this one article I read. Their bodies use twice the amount of natural made nitric oxide, a proven smooth muscle relaxation agent, to dilate blood vessels so that blood pressure decreases and the vessels can take an increased blood capacity to deliver more oxygen to muscles. Thats a suitable body adaptation after hundreds of years in the mountains. Quick side thought. That must be awesome for a cyclist from Tibet! And do Tour riders use Nitric Acid supplementation in any way or form? Is that considered illegal? I know many body builders swear by it. I like to fantasize about putting people from different regions and races on bicycles. I'm certain of the fact that there are hundreds of people physiologically different and suited for endurance events like a pro level international stage race. In my last post, I hinted at my belief that with proper training, an East African could easily outwit someone like Tom Boonen at the line. Seriously, if I were the manager of a pro level team, I would choose my boys carefully from hitherto unknown parts of the world to make them champs. However, I don't believe in a vague term like genes. I like to use the term adaptation. wow - what a great overview photo! Cycling in Tibet, now there's a dream I like! Taking a cable car to about 13,000 feet near Mont Blanc made me physically dizzy - I could only imagine going higher and trying to mountain bike with a Tibetan.